Since 2003 when the CIAC moved the state championships from Yale to the Floyd Little Athletic Center on Hillhouse High School's campus, the Academics have taken home either a boys or girls CIAC team trophy every year but one. Each year the boys and girls cheer for each other like brothers and sisters and really show what it means to be gracious hosts as they rest of the state comes into their house. This big family is led by a husband and wife team of Gary and Michelle Moore who have overseen the program to become probably the most successful combined programs in state history. While the Moores are like a mother and father to many of the athletes they coach, this year their actual daughter, Leah, who is a freshman won the shot put with a throw of 39'0. Gary and Michelle were obviously proud parents, but this was just one of the many outstanding accomplishments they were proud of on Friday night. 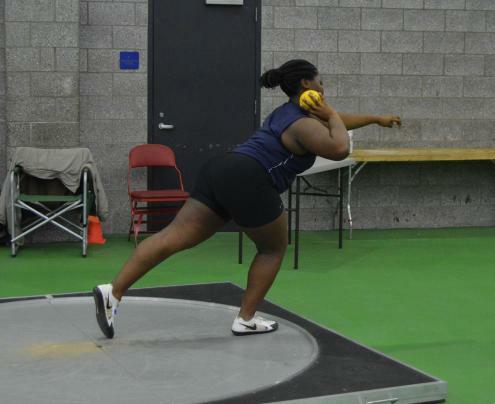 Other gold medal performances were achieved by Ayesha Nelson who won the 55m in a season best of 7.39. Jada Boyd was a double winner in the 600m (1:37.07) and 300m (41.81)races while her freshman teammate Nyia White took the runner up spots in both races. Senior Kristen Washington also did her part by jumping 17'1 to win the long jump and combine with underclassmen Ayesha Nelson, Vida Harris, and Nyimah Ambrose to take the 4 x 200m. The gentlemen from Hillhouse only scored in six events, but when they did score, they packed a wallop in their punches. They went right to the lead immediately after scoring 20 points in the first two events. The 4 x 200m made up of Deshaune Poole, Neal Eley, Quintus Reid, and Naszier Torrence Robinson took first in 1:34.29. Just a few minutes later they took the 4 x 800m with Manasseh Bekele, Talib McBride, Dale Thompson and Ryan Martinez combining to run a 8:21.15. Junior Deshaune Poole, who is looking like he will become a real threat in the 300IH outdoors, won the Class M title in the flat 300m in a person record of 35.86 and took 2nd in the 55HH in 7.76. 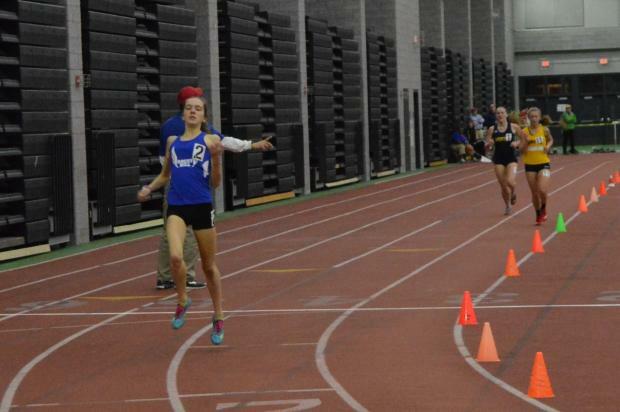 Just like the girls, Hillhouse went 1-2 in the 600m with Bekele taking it in 1:23.29 and McBride running 1:23.73 with barely an hour to recover from their 4 x 800m victory. To show off his team dedication, Bekele finished off the day with a 3rd place in the 300m to take part in 26 team points. Probably one of the best non-Hillhouse performances of the day was turned in by sophomore Elizabeth Stockman of Rocky Hill. She pulled off the tough distance double winning the 1600 and 3200m races in state leading times of 5:03.68 and 10:54.02. She began the day with a real challenge from Weston's Kathleen Murphy who had the state lead in the mile with a 5:05. Murphy, who been accepted to the United States Naval Academy, stalked the sophomore the entire race until just under laps to go when she made her move. Stockman found another gear and pulled ahead to win by 4 seconds and running the 9th best time in the country. Stockman had an easier time of it in the 3200m and ran the race alone only have lapped runner to competed against and winning by 46 seconds in a time which is a new class meet record and is currently ranked 9th in the US. The only other class record was set by the Weston boys team of Jack Weiss, Kevin Stankiewicz, Baruch Goodman and Tim Lautenbach who broke their own mark set three years ago with a new record of 3:38.99. 51 performances met the MileSplit US Second Team standard.